The surest way to prevent Lyme or other tick-borne diseases is to avoid being bitten by ticks. 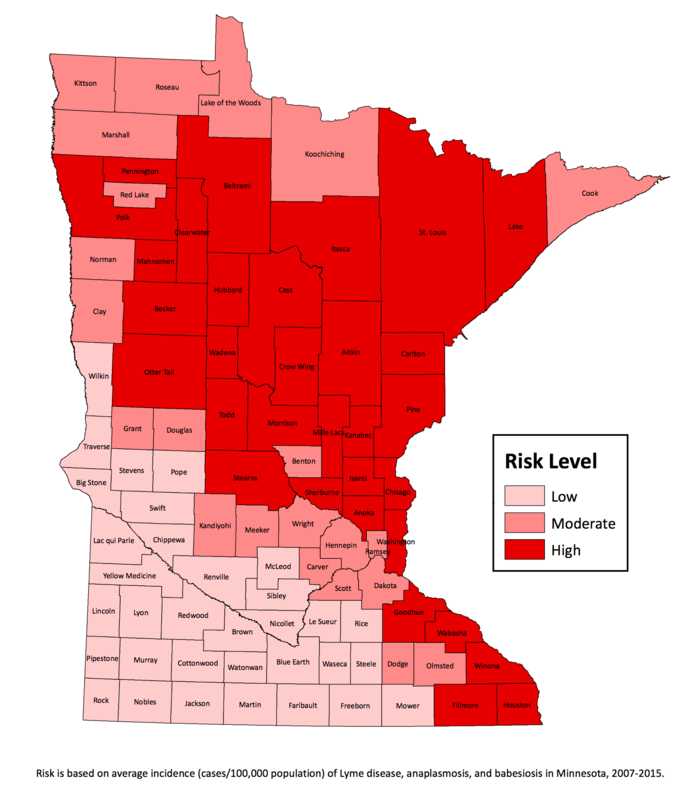 In Minnesota, the areas with the highest risk are the southeast, east central and north central regions of the state. It is important to note that ticks are found across the state, in grassy fields, brush-filled wooded landscapes and places where residential neighborhoods meet the forest edge. If you work or recreate in these environments, take special precautions to protect yourself and your loved ones. Almost all cases of Lyme disease start from the bite of an infected deer tick. Not all ticks are infected; infection rates vary from one locality to another. Ticks have 4 life stages, egg, larva, nymph and adult and each tick feeds 3 times during their life. Nymphal deer ticks, which cause most of the cases of Lyme disease, are tiny, about the size of a poppy seed. Adult deer ticks can also cause infection. Because their bite is painless, you may not notice that you have been bitten. The longer ticks are attached, the greater the risk for developing Lyme or other tick-transmitted diseases. Bites lasting less than 24 hours rarely result in Lyme disease but when an infected tick remains attached for the entire 3-4 day feeding period, the risk of infection becomes greater than 90%. Take these steps to reduce the risk of a bite or tick attachment lasting more than 24 hours. Reduce tick habitat where you live, work and play. On your property, remove fallen leaves, cut the grass short and keep woodpiles neat to reduce tick numbers. Landscape to discourage ticks from hanging around your yard. The Tick Management Handbook describes several steps (begins on page 40). Use sprays containing permethrin on your clothing, footwear, camping and hunting gear and 30% DEET or 20% picaridin on your skin. Tuck shirts into pants, pant legs into socks, tie up long hair and tuck into a hat, etc., to inhibit tick movement. Promptly put tick-exposed clothing into the dryer on high heat for 60 min if wet/damp or 15 min if dry. Take a shower; vigorous scrubbing will remove ticks that aren’t fully attached. Check yourself and your animals for ticks immediately and for several days after being in a tick-infested area. Make tick checks a habit for all family members after any outdoor activity. The sooner ticks are found and removed, the less chance you and your family have of becoming infected. Carefully remove and save any attached ticks for your doctor to identify.